In 1871 old infirmary buildings were moved from downtown San Jose, to the newly purchased property just outside the city limits. The Santa Clara County Hospital (infirmary) was constructed in 1875, at a cost of twenty thousand dollars. At the time, it was located three miles south-west of the San Jose city boundary. It took many years of petitioning by local physicians and concerned citizens to convince the county to pass a Bonds act to pay for the construction of the hospital. Dr. A. J. Cory, the first appointed physician and surgeon of the county and infirmary said of the hospital construction that “…everything conductive to the welfare of the waifs of humanity has been done, so that their sufferings may be assuaged and their pillows smoothed as they fall into the grave”(Munro-Fraiser, J.P. 1881:148). The hospital was three stories high and contained six wards that accommodated sixty-five patients. Gas, water, and other modern amenities were connected with the main building. There was three other buildings located on the campus, containing nine wards with a capacity to accommodate an additional fifty patients. One hundred and fourteen acres of land were owned by the county hospital. Little information is publicly available about the use and construction of the cemetery. This information will hopefully be filled in with archival research this summer. Source: Munro-Fraiser, J.P. 1881. 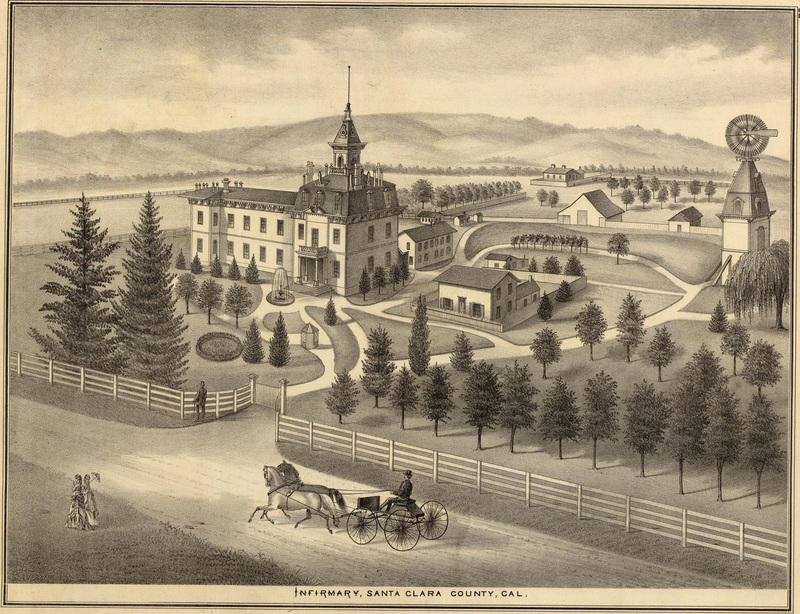 History of Santa Clara County, California.